The eigenproblem solver in my master's thesis used SuperLU, a direct solver for the solution of systems of linear equations (SLE) . For the largest test problems, the eigensolver ran out of memory when decomposing the matrix which is why I replaced SuperLU with direct substructuring in an attempt to reduce memory consumption. For this blog post, I measured set-up time, solve time, and memory consumption of SuperLU and direct substructuring with real symmetric positive definite real-world matrices for SLEs with a variable number of right-hand sides, I will highlight that SuperLU was deployed with a suboptimal parameter choice, and why the memory consumption of the decomposition of is the wrong objective function when you want to avoid running out of memory. For my master's thesis, I implemented a solver for large, sparse generalized eigenvalue problems that used SuperLU to solve SLEs , where is large, sparse, and Hermitian positive definite (HPD) or real symmetric positive definite. SuperLU is a direct solver for such SLEs but depending on the structure of the non-zero matrix entries, there may be so much fill-in that the solver runs out of memory when attempting to factorize and this happened for the largest test problems in my master's thesis. Without carefully measuring the memory consumption, I replaced SuperLU with direct substructuring. Our aim is to solve SLEs and so far, I did not explain how to solve SLEs . We could solve this SLE directly with a dense or a sparse solver or we can apply the idea from above again, i.e., we partition into a block matrix, partition and conformally, and solve . This recursive approach yields a method that is called direct substructuring and it belongs to the class of domain decomposition methods. Usually, direct substructuring is used in conjunction with Krylov subspace methods; the SLE solver MUMPS is an exception to this rule. See the paper Iterative versus direct parallel substructuring methods in semiconductor device modeling for a comparison of these approaches. Observe for direct substructuring, we only need to store the results of the factorization of the Schur complements, e.g., the matrices and of the LU decomposition of so the memory consumption of the factorization of is a function of the dimension of . Furthermore, we can quickly minimize the dimension of the block with the aid of nested dissection orderings, a method based on minimal vertex separators in graph theory. Thus, it is possible to use direct substructuring in practice. Before presenting the results of the numerical experiments, I elaborate on the suboptimal parameter choice for SuperLU and afterwards, I explain why using direct substructuring was ill-advised. where is a small, user-provided constant. 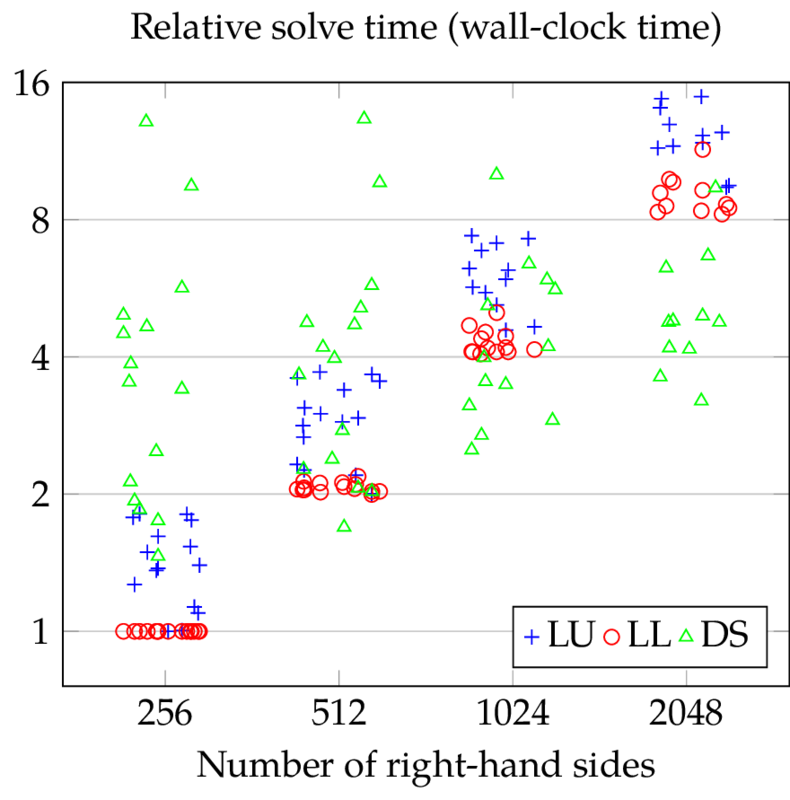 Consequently, for sufficiently well-conditioned HPD matrices, SuperLU will use and compute a Cholesky decomposition such that , approximately halving the memory consumption in comparison to an LU decomposition. For badly conditioned or indefinite matrices, SuperLU will thus destroy hermiticity as soon as a diagonal element violates the admission criterion for pivoting elements above and compute an LU decomposition. For HPD matrices small pivots do not hurt numerical stability and in my thesis, I used only HPD matrices. For large matrices, SuperLU was often computing LU instead of Cholesky decompositions and while this behavior is completely reasonable, it was also unnecessary and it can be avoided by setting thereby forcing SuperLU to compute Cholesky factorizations. Given an SLE and a suitable factorization of , a direct solver can overwrite with such that no temporary storage is needed. Hence as long as there is sufficient memory for storing the factorization of and the right-hand sides , we can solve SLEs. of storage. For comparison, storing the matrix consumes 0.3MiB while the 2,455,670 non-zeros of the test matrix s3dkq4m2 (see the section with the numerical experiments) with dimension 90,449 require 18.7MiB of memory, and the sparse Cholesky factorization of s3dkq4m2 computed by SuperLU occupies 761MiB. Keep in mind that direct substructuring is a recursive method, i.e., we have to store a matrix at every level of recursion. If we want to avoid running out of memory, then we have to reduce the maximum memory usage. When I decided to replace SuperLU with direct substructuring, I attempted to reduce the memory required for storing the matrix factorization. With SuperLU, maximum memory consumption and memory required for storing the matrix factorization are the same but not for direct substructuring. In fact, the maximum memory consumption is often magnitudes larger than the storage required for the factors of the Schur complements. the time needed to solve SLEs with 256, 512, 1024, and 2048 right-hand sides (RHS). These matrices can be found at the University of Florida Sparse Matrix Collection. The smallest matrix has dimension 1074, the largest matrix has dimension 217,918, the median is 6458, and the arithmetic mean is 37,566. For the timing tests, I measured wall-clock time and CPU time and both timers have a resolution of 0.1 seconds. The computer used for the tests has an AMD Athlon II X2 270 CPU and 8GB RAM. Direct substructuring was implemented in Python with SciPy 0.17.1 and NumPy 1.10.4 using Intel MKL 11.3. SuperLU ships with SciPy. The right-hand sides vectors are random vectors with uniformly distributed entries in the interval . 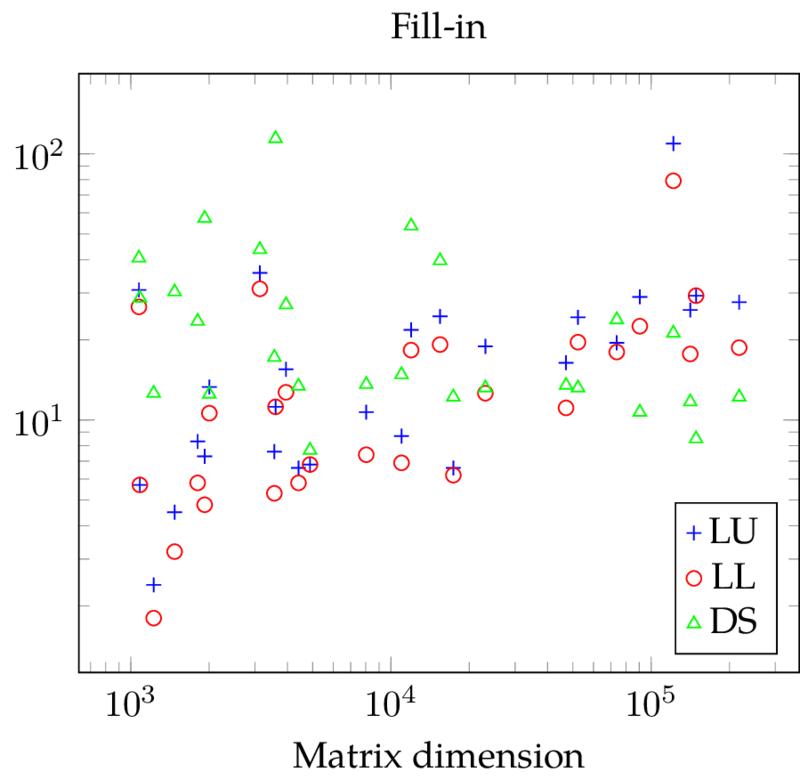 With the fill-in plot, it is easy to see that LL requires less memory than LU. For direct substructuring, the fill-in is constant except for a few outliers where the matrix is diagonal. 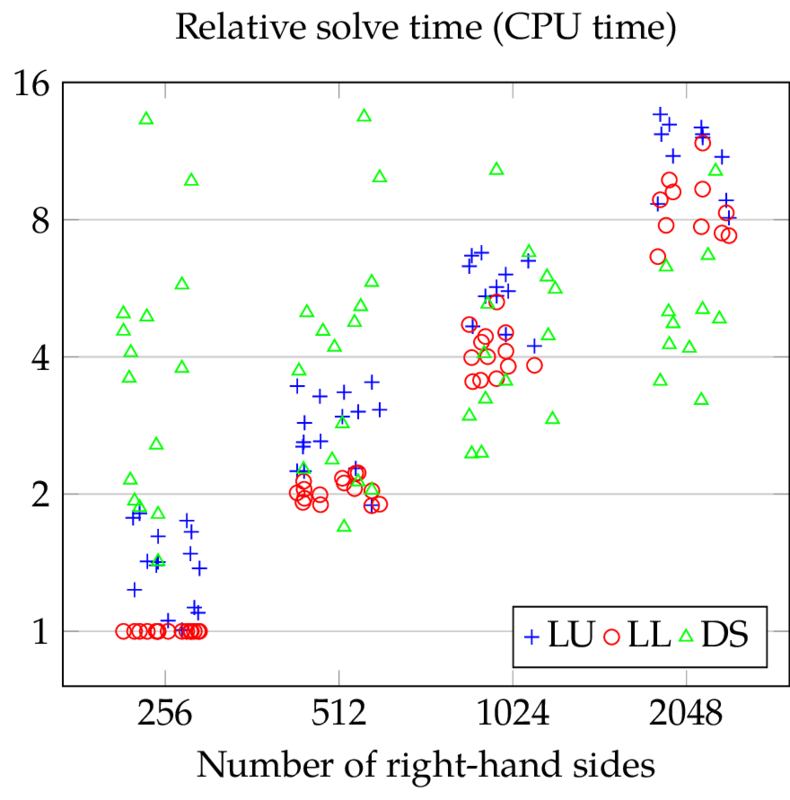 For the smallest problems, both SuperLU variants create less fill-in but for the larger test matrices, DS is comparable to LL and sometimes better. Unfortunately, we can also gather from the plot that the fill-in seems to be a linear function of the matrix dimension with SuperLU. If we assume that the number of non-zero entries in a sparse matrix is a linear function of , too, then the number of non-zero entries in the factorization must be proportional to . When considering maxmimum memory consumption, DS is significantly worse than LL and LU. 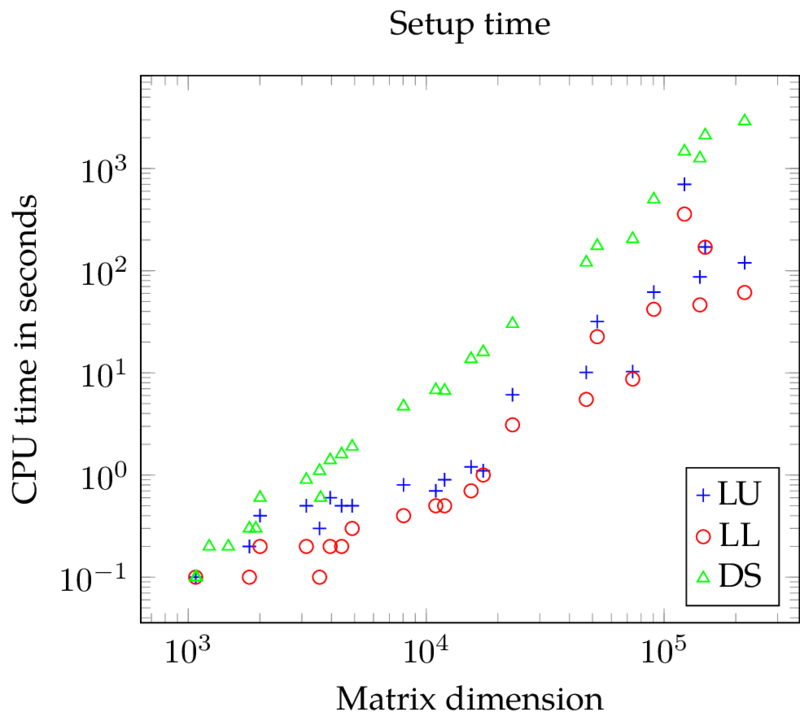 The plot showing the setup time of the solvers are unambiguous: LL needs slightly less time than LU and LL as well as LU require both significantly less time than DS (note the logarithmic scale). Before I present the measurements for the time needed to solve the SLEs, I have to highlight a limitation of SciPy's SuperLU interface. As soon as one computed the LU or Cholesky decomposition of a matrix of an SLE , there is no need for additional memory because the RHS can be overwritten directly with . This is exploited by software, e.g., LAPACK as well as SuperLU. Nevertheless, SciPy's SuperLU interface stores the solution in newly allocated memory and this leaves SuperLU unable to solve seven (LU) and six SLEs (LL), respectively. For comparison, DS is unable to solve six SLEs. The time needed to solve an SLE depends on the number of RHS, on the dimension of the matrix , other properties of like node degrees. To avoid complex figures, I plotted the solve time normalized by the time needed by LL for solving an SLE with 256 RHS and the same matrix over the number of RHS and the results can be seen below. Due to the normalization, I removed all SLEs where LL was unable to solve with 256 RHS. Moreover, the plot ignores all SLEs where the solver took less than one second to compute the solution to reduce jitter caused by the timer resolution (0.1 seconds) and finally, I perturbed the -coordinate of the data points to improve legibility. Let be the number of RHS (the number of columns of ) and let be the number of columns of . In practice, will be considerably smaller than in dimension hence the majority of computational effort is required for the evaluation of and . If we evaluate the latter term as , then DS behaves almost as if there were RHS. For small , this will clearly impact the run-time, e.g., with , the number of RHS is effectively doubled. We introduced direct substructuring, briefly highlighted how SuperLU can be forced to compute Cholesky decompositions of Hermitian positive definite matrices, and that fill-in and maximum memory consumption are two different quantities when solving SLEs with direct substructuring. We compared maximum memory consumption, setup time, and solve time of SuperLU and direct substructuring for SLEs in experiments with real symmetric positive definite real-world matrices and a varying number of right-hand sides. SuperLU with forced symmetric pivoting has the smallest setup time and solves SLEs faster than SuperLU with its default settings. Direct substructuring requires the most storage, it is slow if there are few right-hand sides but it is by far the fastest solver if there are many right-hand sides in relation to the dimension of the matrix . The code generating the measurements can be found in DCGeig commit c1e0, July 16, 2016.